you are correct. It does! Peggy Chinn and I, along with the other members of the INANE Internet Workgroup, are working on a major overhaul of the INANE website and the blog. The best news is that now the website and blog are going to be together in one place. No more needing to remember two URLs or switch back and forth to find essential information. It is all here at nursingeditors.com. 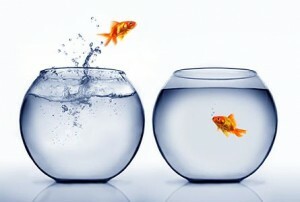 The blog and the website will now live together in the same fishbowl! As part of this transformation, I have switched the blog theme to more easily accommodate the needs of the website. Before it looked like a magazine or the front page of a newspaper with lots of different stories. Now it has a more traditional blog look, with posts scrolling down and the most recent (like this one) at the top. I liked the old style but this format will be more workable for a website in the long run. Within the blog, Peggy and I have created a special category page where we have gathered the tributes to Suzanne Smith as well as her “Who’s Who” page from the INANE website. You can access the page by clicking here. Note that the posts about Suzanne are also still contained within the blog itself, in chronological order. The tribute post has 38 comments and over the past two months, I’ve gone back many times to re-read them. Comments are not closed. If you have been thinking about Suzanne, take a minute to share your thoughts in a comment. This post, the comments, and the category page will be preserved ad infinitum; we consider Suzanne’s memory an important part of our INANE legacy. Also with our updating, I have created a page where it is possible to donate to the Suzanne Smith Development Fund, right here from the website. All of us hope this initiative will live on beyond the INANE 2014 conference and having a donation page here is part of our planning for that future. If you have not yet donated to the fund, please take a moment to do so and help keep Suzanne’s memory alive in our organization. Thank you in advance for your generosity. If you are reading this blog post, you will likely start poking around the website. Realize that this is a work in progress and there will be updates and changes over the coming days and weeks. Still, the essential navigation remains the same; we hope it looks familiar to all of you. If you have questions or feedback about the look or what we should include, use the contact page to send feedback. You can also leave a comment below. I along with Peggy and the other members of the workgroup look froward to hearing from you! This entry was posted in Administrivia and tagged blog, WordPress by Leslie. Bookmark the permalink. Thanks for putting this up for everyone, Leslie! I am very excited about this shift, and working hard to make it complete! And I agree, it would be terrific to have folks send us their suggestions and comments!